The number of program participants and the count of sites receiving support remained steady. The price of Category 1 broadband connectivity continues to drop. Applicants are getting faster Internet connections for a lower price than they were paying last year. The demand for Category 2 Wi-Fi and other on-campus connectivity remains strong. Applications for internal connections this year were at the highest level since 2016. 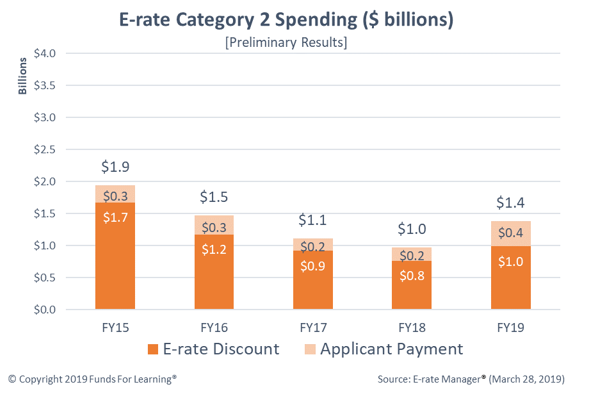 Join Funds For Learning on April 17, 2019, for our FY2019 Filing Window Recap. We will provide a complete overview of the funding year 2019 filing window. Register here to attend. 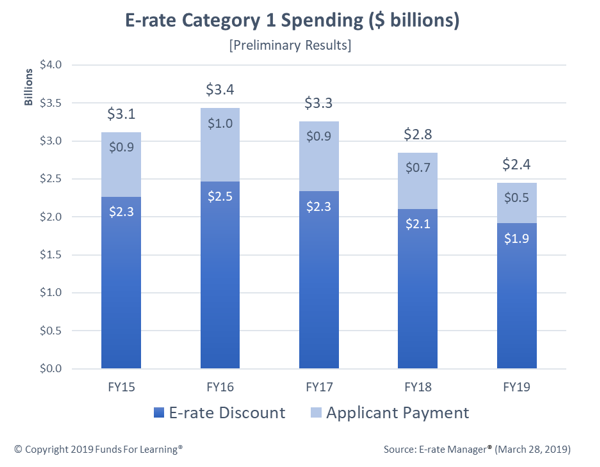 Below are the initial summary statistics for funding year 2019 in comparison to recent years. NOTE: Each year, the FCC does grant a limited number of waivers of the filing window deadline. We anticipate additional Form 471s being submitted over the course of the next two weeks. For example, in 2018, about 4% of the overall demand arrived after the close of the filing window.